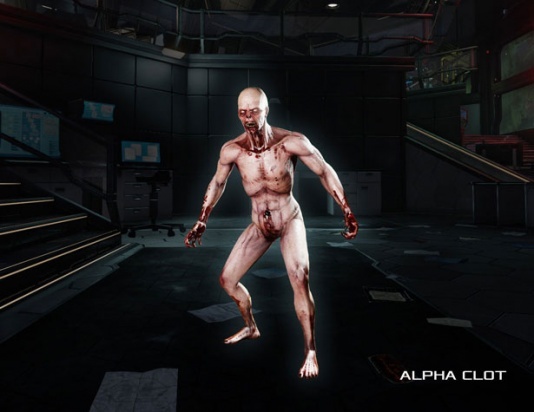 The Alpha Clot is a common specimen in Killing Floor 2. It is classified as a lesser enemy, and therefore, cannon fodder. Although extremely weak on their own, their real strength comes in numbers. Clots move slowly when docile, and sprint when enraged. On higher difficulties, Clots have a chance to enrage upon sighting the players, and have a chance to enrage when shot. Once enraged, Clots will never stop sprinting until they are killed. Should sprint if can sprint OR (if can sprint when damaged AND damaged) (i.e. if sprint chance met its value). Should sprint when frustrated. 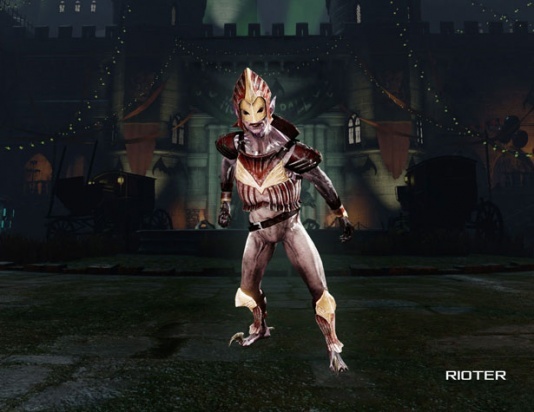 Rioter cannot sprint while wearing the armor and will sprint upon loosing it. Clots have little to no weaknesses, and have a few crippling resistances. Clots have no resistances to ballistic weaponry and are extremely vulnerable to sub-machine guns. Clots only have one weak spot, which is the head. The Alpha Clot is a predictable, melee-only ZED. 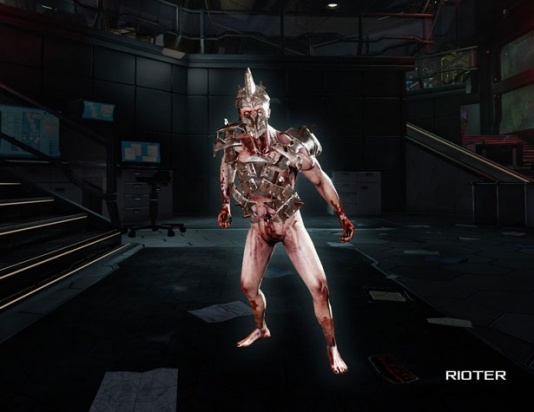 On Suicidal and Hell On Earth, Clots gain additional attack animations that they will use when they are enraged. Other than that, their behavior does not change drastically between the difficulties. 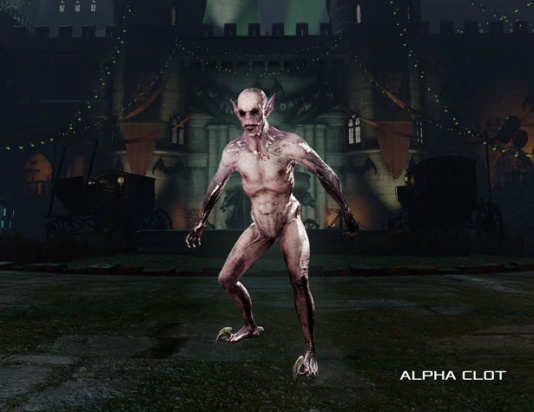 Alpha Clots have a chance of spawning as Rioters, aka Elite Alphas, Albino Clots and King Clots. These Clots can be easily identified by the armored plates of their chests, face and iroquois-looking helmet, whiter skin tone, along with visible blue veins on their body. 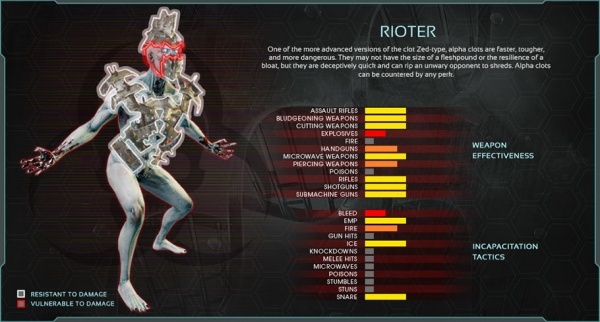 Rioters have different statistics as compared to normal Alpha Clots, and they have the ability to rally surrounding ZEDs. It is recommended to quickly find them and kill them before they can use their ability. They usually weave in and out among the ZED hordes before using Rally. Chance to spawn as Rioter: Normal - 0, Hard - 0, Suicidal - 0.25, HOE - 0.35. Rally chance: Suicidal - 0.7, HOE - 0.8. Rally cooldown: Suicidal - 15s, HOE - 15s. Self damage dealt multiplier: Suicidal, HOE - x2.5. To activate a Rally there should be at least 4 nearby ZEDs (including Rioter itself) within 10m radius. Rioters wear two pieces of armor - on their torso and head. The armor protect them from taking any damage until the moment it get destroyed. However Rioter's back and legs are still remain exposed so attacking there might be a wise decision. Despite the huge amount of the armor health (450 points), players can still utilize mechanics of how game calculates damage for their advantage: damage to head (per single bullet / projectile) greater than Rioter's head value (125) will likely be fatal to it or at least will destroy its armor. Rioters are notably vulnerable to fire, taking 200% more damage from it (x3 multiplier) than normal Alpha Clots. Rioters do not sprint while they wear armor but will enrage instantly when either of pieces destroyed. Rioters move approximately 10% slower than normal Alpha Clots. (PvP) Rally boost: forces AI Alpha Clots to sprint, players do x1.5 more damage. Damage to doors (possible values) = 18 / 36. Alpha Clot cannot grab the player for 1 second after grenade throw. Alpha Clot cannot grab the player for 0.5 seconds after shooting the healing dart. Alpha Clot has a chance to evade certain damage sources. 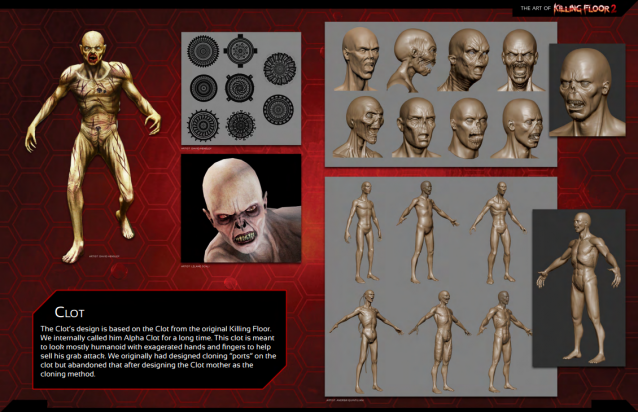 In later waves, Clots are there to populate the waves and distract players from larger threats. Try to take them out quickly so you can focus on the real threats sooner. 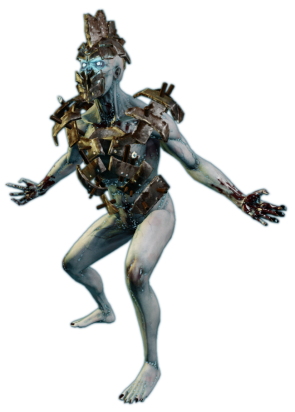 Extremely weak to Sub-machine guns, making the SWAT the best perk for quickly exterminating huge groups of Clots. Beware of their grabs, as Clots can end games by catching the last surviving player off-guard and immobilizing them, giving the larger enemies enough time to catch up and kill them.